It is generally thought that Porcius Festus succeeded Felix as governor around AD 59. 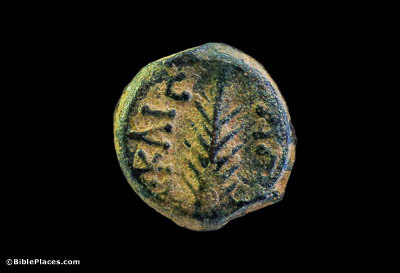 The coin shown here was likely minted by Festus, but since scholars do not agree upon the year when Festus succeeded Felix, there is some uncertainty as to which procurator minted this coin. It depicts a palm branch and bears the Latin inscription “of Caesar,” alongside an inscription that indicates it was minted in the fifth year of Nero (either AD 58 or 59). Festus . 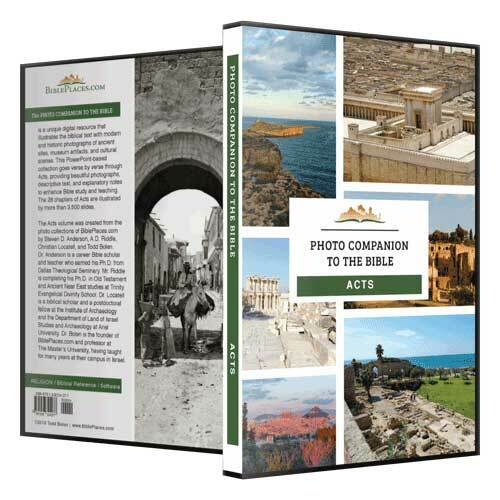 . . after three days went up to Jerusalem from Caesarea (Acts 25:1). Caesarea is located on the shore of the Mediterranean Sea, whereas Jerusalem is located along the ridge of the hill country at an elevation of 2,474 feet (754 m). Festus’s trip from to Caesarea to Jerusalem was literally “up.” The distance between Caesarea and Jerusalem is approximately 60 miles (100 km). 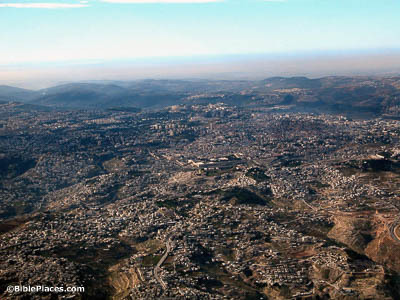 The modern view of Jerusalem shown here is toward the west and north, the direction from which Festus would have come. In Paul’s day, most of the hills seen here would have been uninhabited. And the high priests and leading Jews accused Paul (Acts 25:2). It is interesting that the plural, “high priests,” is used here. Although the practice in the Old Testament was for the high priest to serve until he died, Josephus makes it clear that the office was much more political in the 1st century. Caiaphas, who was high priest during the trial of Jesus, was deposed a few years later by Vitellius, the governor of Syria, and his brother-in-law Jonathan was installed in his place (Ant. 18:95). This kind of activity quickly led to the situation where there was more than one high priest alive at once, although only one held the official position. 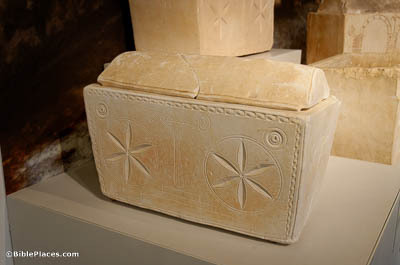 Shown here is an ossuary famously inscribed with Caiaphas’s name, though its small size suggests that it held the bones of a child rather than an adult. Festus . . . answered, “You have appealed to Caesar; to Caesar you will go” (Acts 25:12). Historians indicate that appeal to a higher magistrate or even to Caesar himself was a right of Roman citizens. The drawback was that this could require a rather long wait in confinement, as there was typically a lengthy backlog of cases waiting to be heard. It is probable as well that some cases were decided by assistants to the emperor or were simply never heard. 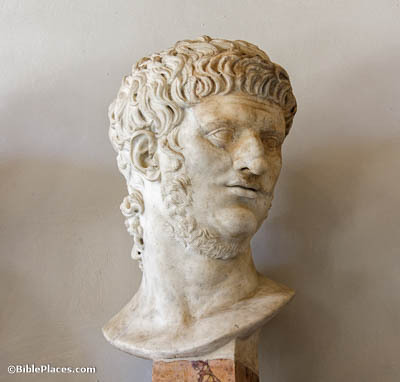 Nero was Caesar from 54 to 68, so he was the Caesar to whom Paul appealed. They brought no charge of evil things such as I had supposed (Acts 25:18). When he heard of Paul’s case, Festus expected charges to be brought against him that would have justified his imprisonment, such as incitement of insurrection or other violent acts. Upon hearing the actual charges, he was surprised to learn that they did not involve anything of the kind. 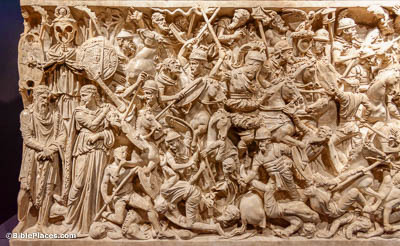 The scene carved on this sarcophagus, found near the Via Tiburtin, exhibits a wild brawl between soldiers and barbarians, such as may have arisen in the mind of Festus.